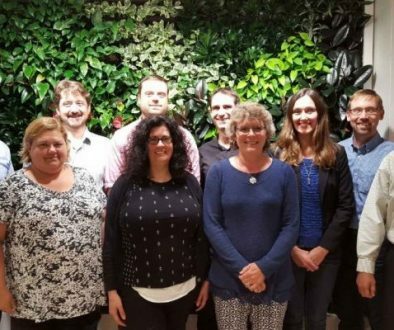 The Environmental Managers Association of BC held their annual workshop on March 7th, 2019 at SFU’s Harbour Centre. This year’s topic was “Keeping up with Environmental Change” and speakers discussed topics around Ecosystem Management, Renewable and Alternative Energy and Climate Change. Each session incorporated some of the premier environmental professionals in their field, presenting the latest updates on various topics followed by engaging discussion with everyone in attendance. The event kicked off with Roy Brooke – Executive Director, Municipal Natural Assets Initiative, who brought forth their work on how to assign value and take advantage of natural assets in any engineering or construction project. This was followed up by the work of Matilda van den Bosch – Assistant Professor, UBC Department of Forest and Conservation Services, who looks at the impact of our environment on human health and psychology. Following our first networking session, environmental regulatory updates were provided by Nathan Braun – Executive Project Director, BC Environmental Assessment Office, and Gabby Pang – Fisheries Protection Biologist with Fisheries and Oceans Canada. Nathan focused on the EAO’s revitalization which will include various changes such as more First Nations involvement and an expected completion date of late 2019. Gabby updated us on the Fisheries Act and the Bill C68 update; this bill will also be looking for approval in late 2019. Sarah Buckle – Director, Enterprise Risk and Sustainability, Translink reported on Translinks’ plan to switch over to a fully battery power fleet and intended renewable energy uses across the company. Charlie Palmer – Practice Leader, Environmental Impact Assessment with Hemmera discussed the emerging wind energy market in BC and some of the strategies to harness this energy source during down time. Richard and Norm discussed the plan for economical solar communities and some of the pioneering work including the urban solar garden in New Westminster. Erin Quon and Sampoorna Biswas of CLIR Renewable demonstrated their software solutions for optimizing renewable energy sources. The next group of speakers focused on emerging initiatives aimed towards mitigating climate change. Timo Makinen of the Canadian National Industrial Symbiosis Program lead off with their initiative in waste reduction through programs connected waste producers with those who can take advantage of what otherwise would go to landfill. Amelia Needoba of Diamondhead consulting then presented on the benefit of trees and greenspaces in the urban environment and how to select the correct tree species for your project. Clive Welham from 3Green Tree Ecosystem Services, a full service forest ecosystem asset development, acquisition and management company; showed how critical carbon storage considerations are for any development project. Nelson Lee of Green Sky Sustainability Consulting closed out the session with an inspiring discussion on the importance of climate change mitigation. The final topic of the day was the meet your regulator session. Ten regulators from various levels of government were in attendance. The open floor nature of this portion of the event provides the opportunity for attendees to ask the questions that directly impact our daily work as environmental managers. Those in attendance included.